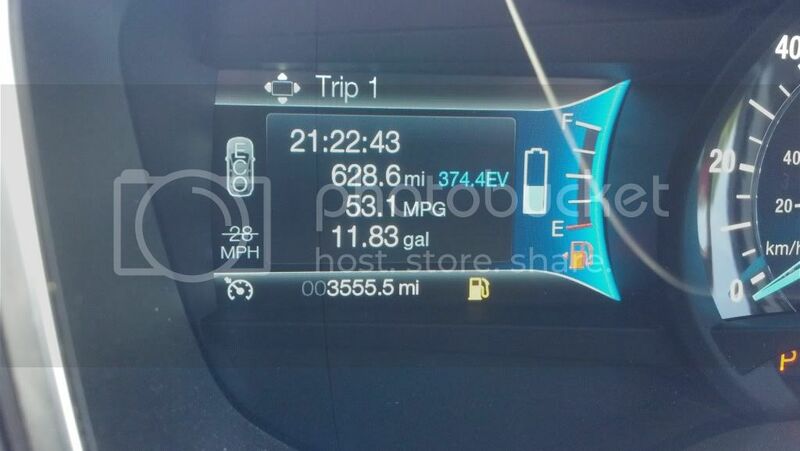 On the C-Max Forum they have threads to post tanks of 600+ miles and 700+ miles so I'm stealing their idea for here. Let's see how we do. There are a ton of 600+ mile tanks over there and even quite a few 700+ mile tanks. Edited by hybridbear, 14 June 2013 - 08:24 AM. I'll be happy when I get my first 500+ tank ... 600 and 700 are way too distant. Ordered: 11/19/12 | VIN Assigned: 2/28/13 | Build Date: 3/21/13 | ETA: 4/6/13 | Delivery Date: April 5th, 2013 !!! Not with mine, <450 is average. My mpg's are like neod192's no matter how hard I try, that's been constant from the beginning - Job 1. Edited by GrySql, 14 June 2013 - 11:48 AM. 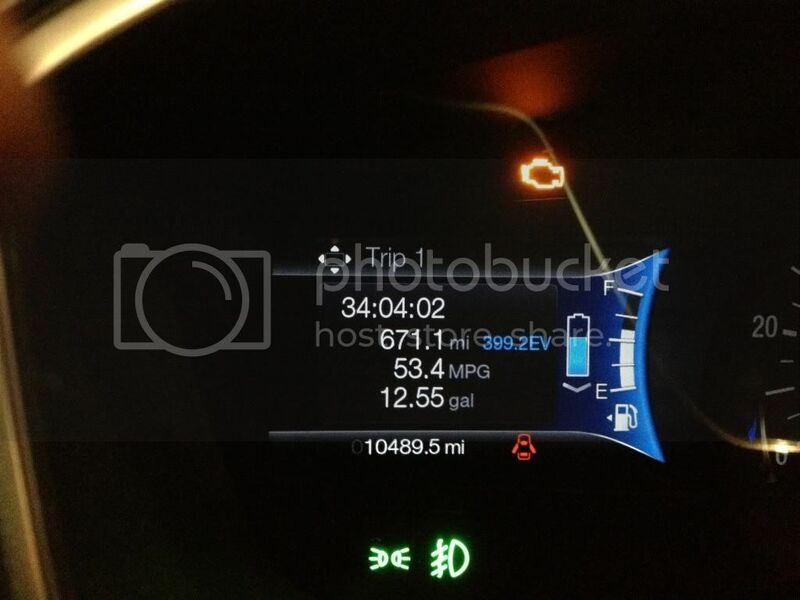 The highest I've gone is 458 miles on a tankful so far, but I get nervous when the fuel gauge starts getting low - I'm pretty sure I could have gone over 500 since I only put in 10.2 gallons for that 458 miles driven. I'll try on this next fill-up and see how far I can go. I've gotten as high as 580 on the FFH and I had about 2 gallons left. I used to drive my 2010 3.0 Fusion to Ohio all the time. From driveway to driveway it was 452 miles. In the Winter I had to stop. In the Summer I've would get there hand have about 20 MTE left. Edited by hermans, 14 June 2013 - 04:08 PM. My car had half a tank when I got it. I'm at 225 miles with a little under a quarter of a tank left. If this car keeps performing like this, I think I'll be joining this club eventually! I'm assuming you got a new car. You paid for a full tank of gas, it's in the price of your car. Not very nice of the dealer to do that to you. They are to fill the tank at delivery. Edited by hermans, 18 June 2013 - 06:35 AM. Have had 32 fill-ups thus far... 5 of the last 11 have been over 600 - yesterday was 613 and DTE was 26, so could have made 650 easily but 700 would have been doing a Kramer stretch. I don't like to go less than 1/8 tank most of the time which is still alot of miles left in the tank with this car. Won't see me here anytime soon, haha. Unless my driving needs change, I won't be on this thread much either. 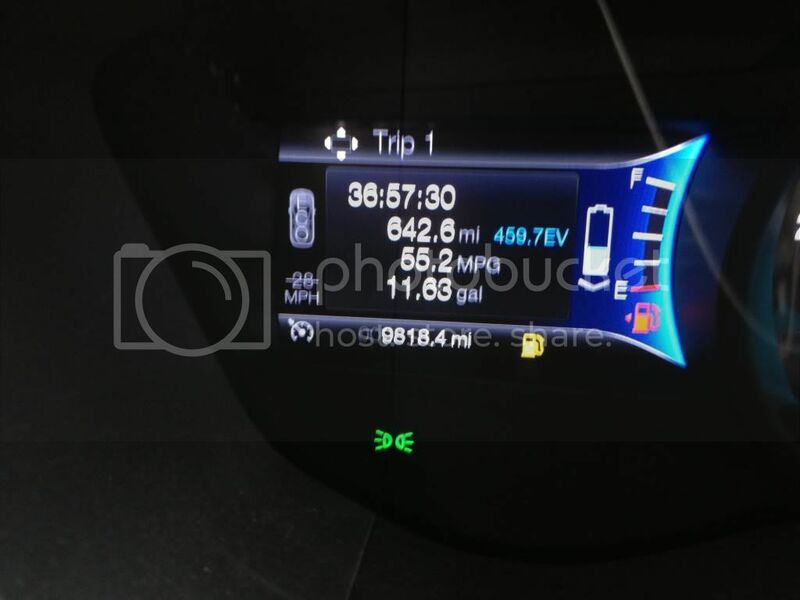 I saw over 500 for the first time this past tank due to not wanting to let the tank get too low and averaging 45-47 MPG doing mostly highway. Still, 500 miles on a tank is very exciting for me. If I still had the 2010, I would be posting in the 700 mile club I have been able to get up to 740 miles on a tank in that one in the summer. Unless some miracle occurs and all the roads I take flatten out, I can only dream of hitting the 600 mile mark in this one. This was the most yet for me, still had a gallon in there (actual fill was 12.46 gallons), so don't think I could have made 700... something to keep shooting for. I don't think I've ever bought a car with a full tank. I've never bought a new or used (CarMax) car that wasn't full when I drove off the lot. Your dealer(s) haven't taken care of you very well. Not sure if I can push myself far enough beyond my safety zone in order to be able to join the elite 600+ club. Technically it should be possible. This is old, but I figured I'd post since I did it once. Haven't been trying so hard recently, been down around 500 miles per tank. 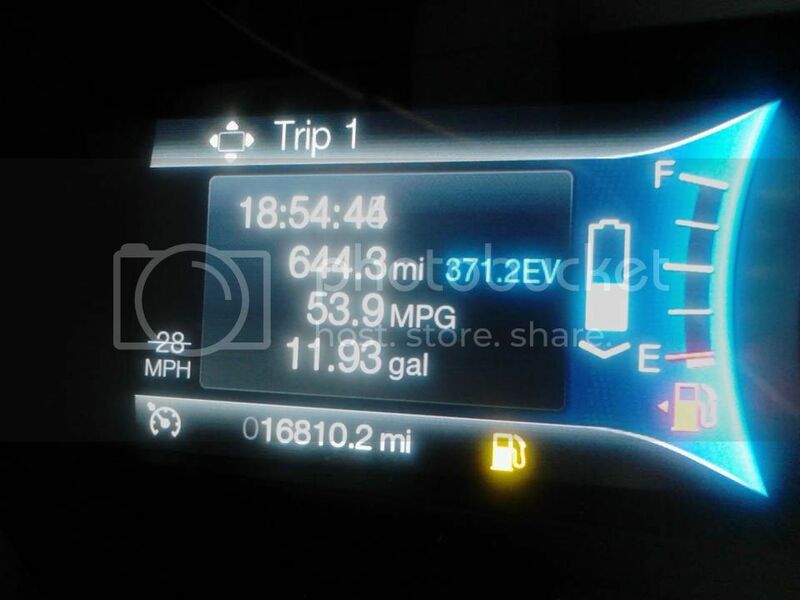 Here is my best tank thus far and went 28 miles past 0 DTE, but as you can see below it said only 12.33 gallons used with MPG of 57.2 so I figured I had gas left. I then filled up and the actual figures were 13.184 gallons for 53.94 MPG which is not quite as great but darn good nonetheless. 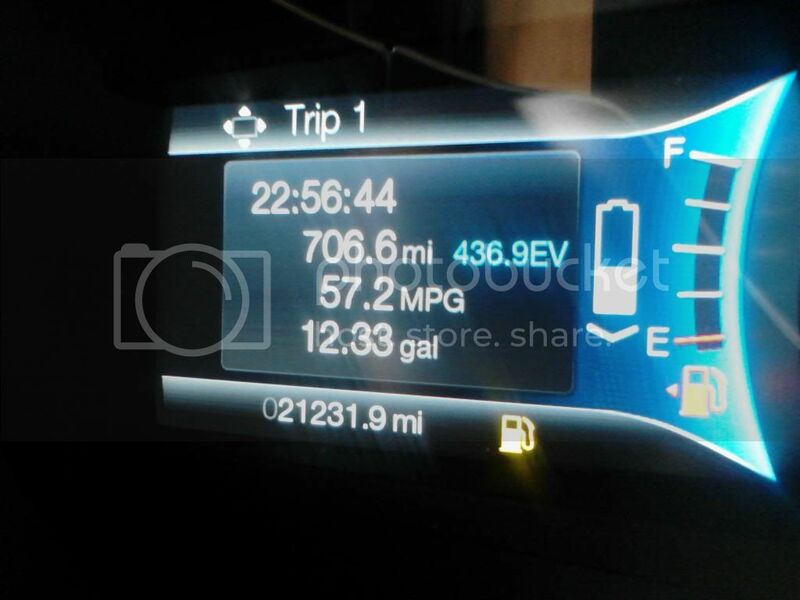 My MPG from display vs actual has always been slightly off, but maybe I should think of it in terms of percentage (higher MPGs meant higher disparity between the two) as this tank was over 3 MPG under on the actual vs the display. The 13B07 PCM update has helped my car, and several of my past tanks would go well until one bad trip or really hot weather came in and jacked things up. BUT - this time the whole week had nice mild weather and good trips (with lots of EV) all around, so it was the 'perfect storm' in a good way. Won't run in EV mode, ICE kicks in immediately. Can I use Low Gear and/or the Downhill Button for Better MPG?